Next week there'll be the 201st anniversary of the death of one of the most famous North American interpreters, Sacagawea (S). I prefer to celebrate people's birthdays rather than their death days, but in this case there's no choice: date of birth unknown. Even the date of her death is disputed but it's officially December 20, 1812. Wish I'd thought of it last year. 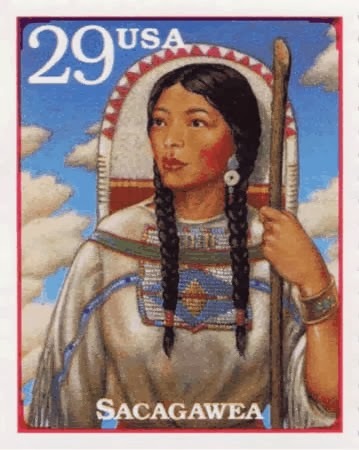 Sacagawea (aka Sakakawea or Sacajawea) earned her fame on several counts. First because she was that rarity: an interpreter who has made it into popular history and legend. She did it by her skills, bravery and hardiness. Secondly because she was a woman interpreter. And thirdly, but not least, because she was a Native American, one whose aid was invaluable to the nascent United States. There's an ample literature about her, both written and audiovisual, both historical and semi-fictional, and including a long Wikipedia article. So this post will only touch on a few aspects that are insufficiently recognised. First we have to know that the Lewis and Clark expedition (LC), which S served, was a military mission that was sent out in 1804-1806 to look for a route through what is now the Western United States to the Pacific. It succeeded despite great hardships. S was a Soshone Indian woman who became multilingual if not as an infant then when she was very young, because she was captured when she was about 12 years old by Hidatsa raiders who spoke a different language. She accompanied her husband on the expedition. S's husband, Toussaint Charbonneau, was a Professional Interpreter as well as an experienced frontiersman. He was taken on by LC from the start of the expedition because they were well aware that they would need interpreters to communicate with the tribes through whose territory they were to pass. S, on the other hand, became an interpreter by chance when LC discovered she spoke Shoshone and they knew they would need the help of Shoshone tribes. She had no training, but on the other hand we can surmise she was a Native Interpreter rather than a Natural one, since she had her husband as example and mentor. S wasn't paid for her work, but Toussaint was: $500 and some 500 acres of land. So we can regard them as a Professional Team. They were professionals in yet another application of interpreting that hasn't been adequately studied, namely exploration and anthropology. It's a form of liaison interpreting. It typically involves little-known languages. S couldn't speak English and therefore couldn't communicate directly with LC. But nor could Toussaint. It had to be done by relay interpreting, using François Labiche, another expedition member, who spoke French and English. Indeed double relay, since S probably spoke Hidatsa with Toussaint. This brings us to the 'French connection' and the role of French Canadians in opening up the American west. Toussaint Charbonneau's name is unmistakeably French; Charbonneau is still a common family name in Quebec. S was far from being either Canadian or French. Yet her working association with Tousssaint incorporates her into the lineage of French Canadian interpreters. Another post on this blog has already provided a glimpse into the origin of the lineage in the 16th century. To find it, enter lafond in the Search box on the right. However, between the late 16th and early 19th centuries there had been a great shake-up in North America. French Canada and its commerce had been taken over by the British. The United States had been formed and had doubled its territory at one swoop by purchasing Louisiana. Nevertheless, through it all, French Canadians had retained a significant role on both sides of what was until our own days a very porous frontier. 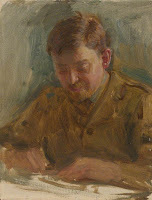 And so, although a few intrepid Brits like John Long had joined the French frontiersmen-interpreters in the push west and north-west (see References), the latter were still invaluable. Thus Toussaint wasn't the only Frenchman with LC. There was also François Labiche, already mentioned; Pierre Creusat, a good boatman and interpreter for Clark; Baptiste Dechamps, head waterman; the Drouillards, father and son; François La Birche, interpreter and boatman; Jean Baptiste Lajeunesse from St. Rose, Quebec; François Rivet, a Montrealer who later worked as interpreter for the Hudson's Bay Company; and so on. Notice that they were valued as 'boatmen' as much as for their interpreting. The French Canadians were famous for their skill at handling the large trading canoes and log rafts on the great rivers and lakes. Later in the century, some of them would even be sent up the Nile to help in the unsuccessful mission to rescue Gordon from Khartoum. And so the members of the LC expedition were a motley corps of multilingual and multicultural adventurers. They spoke English, French and Hidatsu among themselves, Shoshone and other Native American languages with the peoples they fell in with. They included white Americans of English, Irish, Scottish, and Welsh descent; at least one Black American (Clark's manservant York); the French Canadians; Native Americans and persons of mixed race. All of them dependent for their survival, at several crucial stages of the journey, on the skills and personality of Sacagawea. Sacajawea. Wikipedia, 2013. Click here. Lewis and Clark Expedition. Wikipedia, 2013. Click here. Jone Johnson Lewis. Sacagawea (Sacajawea): guide to the west. About.com, 2005. The article is here. A Roster of the Lewis & Clark Expedition. JTR's Colorful Families, 1965. The list is here. John Long. Voyages and Travels of an Indian Interpreter and Trader, describing the Manners and Customs of the North American Indians; with an account of the posts situated on the River Saint Laurence, Lake Ontario, &c. To which is added, A Vocabulary of the Chippeway Language. Names of Furs and Skins in English and French. A List of Words in Iroquois, Mohegan, Shawanee, and Esquimeaux Tongues, and a table showing the Analogy between the Algonkin and Chippeway Languages. London: Printed for the Author; and sold by Robson, Bond-Street; Debrett, Piccadilly... 1791. 295 p. Antiquarian booksellers ask several thousand dollars for the first edition, but there are modern reprints. Commemorative postage stamp. As a portrait it's highly fanciful, since no known picture of her from life has survived. The last post, the one about The Guardian newspaper award to the Young Interpreter (YI) scheme in the UK, brought me some correspondence from experts on legal interpreting in the UK and Holland. They're concerned about whether children ought to be entrusted with translating in a public institution like a school. There's a danger they may be made privy to information they shouldn't have, for example. More generally, they're being given responsibilities – towards the school, other children, parents, et al. – that shouldn't be laid on them at their age. I know from conversations with Claudia Angelelli (see References) that this is a concern in the United States as well; to the extent that some people consider child language brokering a form of exploitation and therefore oppose teaching children to translate. I have my views, but I'm neither a parent nor an educator nor an expert on educational ethics. So I turned for an opinion to Astrid Gouwy, the coordinator of the YI scheme. Here's her reply. "You are right, there is a danger of over-enthusiasm which sometimes can come from certain misconceptions around interpreting as not everyone realises the complexity of the task. The role of Young Interpreters is not to replace professional interpreters in interpreting for situations you mentioned – including PTA meetings. The role of Young Interpreters is to provide peer support to new arrivals in the early stages of learning English so that they feel welcome in their new school. The guidance pack gives examples of how Young Interpreters can help – for example to show a new arrival around the school, or to play a game with them at break times. In addition, the role play situations which are used during the training depict typical situations where Young Interpreters could help – for example what to do if you see a new arrival on their own. Finally, whilst language is an asset for the role and can be used to welcome others, Young Interpreters don’t have to be bilingual or share the same language as their buddy to make them feel happy in their new setting. Effectively, many Young Interpreters won’t ever get to ‘interpret’ in the sense that most people attach to the term. However, they will use a range of strategies learnt in their training to communicate with their buddies and make them feel included e.g. through use of pictures, body language etc. They will also use their many qualities – in fact, one Young Interpreter was telling me the other day that the most important thing about the role was to be caring and kind. "I understand concerns from professional interpreters over the use of children as interpreters but I hope the above clarification of the role of Young Interpreter will reassure them. The new edition which will be out very soon will give further guidance to practitioners in charge of developing the scheme in their schools. This will comprise dos and don’ts of Young Interpreters’ role and more on safeguarding." To this, though it really needs no further comment, I'll append my own simple list of contexts in which I consider – with the reservation mentioned earlier – that translating by children should be scrupulously avoided unless no other translator is obtainable. A. Legal. Those that might have legal implications or repercussions. For instance, a serious dispute between a parent and a school; or an injury to a child that might lead to a claim; or an accusation of sexual assault. B. Medical. Any serious medical problem. The danger in medical interpretation comes not only from conveying wrong information but also from omissions. Unlike Expert Interpreters, Natural Interpreters are not constrained to reproduce everything they hear. Expert Interpreters must struggle to do so; but if Natural Interpreters can't understand or can't reproduce something, they just skip it and carry on. C. Emotional. Something that might cause the interpreter stress, eg having to convey bad news about someone in the family. One of the aforementioned correspondents mentioned a PTA meeting that proposed to use YI but dropped the idea. Sometimes it might be a matter of age. Events like PTA meetings require some knowledge of the school system, of its terminology and of the stakeholders. Perhaps 14 years old would be a viable minimum. I think I knew enough by that age. For more information about YI, click here. Claudia V. Angelelli (San Diego State University). Expanding the abilities of bilingual youngsters: can translation and interpreting help? In M. J. Blasco Mayor and M. A. Jimenez Ivers (eds. ), Interpreting Naturally: a Tribute to Brian Harris, Berne, Lang, 2011, pp. 103-120.